Fashionshop app is a completely White Labelled App With Logo Currency,And Language Options. Kick Start Your Bussiness With Our Most User Friendly App With Most Advance Features our App going to provide its esteemed customers with lots of features, to relish their shopping experience in a more easy and mobile way in order to provide Ubiquity (Easier information access in real-time), Convenience (Devices that store data are always at hand), Accessibility (Choice to limit the accessibility to particular persons who can be contacted anywhere anytime), Personalization (Creating services that customize the end-user experience), and Localization (Matching services to the location of the customers), which is just some taps and swipes away. Product Listing You can add unlimited products in your CMS admin interface and it will sync instantly with your mobile app. Shopping Cart Your users can add single or multiple products to their shopping cart. Fashionshop shopping cart design is simple and fast to glance through. Cash on Delivery Option Cash on Delivery is one of the most popular options in every ecommerce store. If you do not need a payment gateway such as PayPal, your customers can simply checkout their orders with this option. Product Search Your customers can search your products through your app. Product search works fast and gives accurate results based on a user's criteria. PayPal Gateway PayPal payment can be integrated into your app to let your customers pay easier anywhere. The PayPal option is removable if you do not need it later in your panel. Application Menu Very stylish and easy to operate Facebook style Sliding Menu with great option's . A Very Beautifully designed backend with easy to use interface and is more then enough to get any E-Commerce app runing. My Wishlis t It will exhibit the products added by customers which they want to purchase, with product details, selected quantity and an option to add the product to cart or remove it from the wishlist. The app also provides a feature of Sharing the products or wishlist with your friends, and relatives through various platforms. Catalog To provide a hassle free experience for the customer in order to prevent them to search from everything, a catalog accommodates the features of Advanced Layered Navigation, Search Engine Visibility (by capturing traffic with highly relevant keywords), Recently Viewed Products, Options for Comparison, etc. Rewards & Coupan Treat your customers with rewards and incentives for their loyal purchases, referrals, bulk orders, card payments, contest participation, reviews submission, social media participation and much more. Push Notification Connect to your audience more personally and on time. Make sure that all your deals and other promotional activities are heard by your regular customers. You'll have all the liberty to send personalized texts, images and other contents through your custom built Fashion app. Customization Every business has some or the other unique requirements and we certainly welcome it. 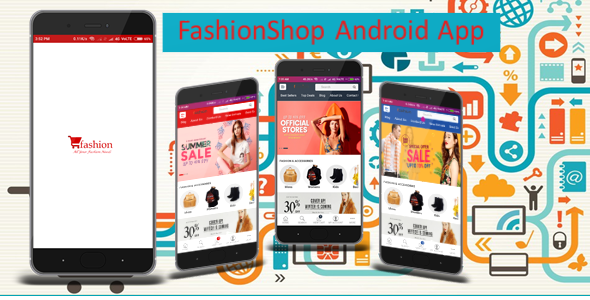 Fashion mobile app development solution is built to embrace change and so 3rd party integrations, APIs, upsizing and downsizing shouldn't be a daunting task. Right from cosmetic to functional changes, every customization can be implemented smoothly. Multiple Promotions Turn your hesitant customers into impulsive shoppers with fetching promotional mechanisms like promo codes, discount offers, daily deals, up-selling offers, combo sales and much more. Keywords: android, AngularJS, api, cordova, ecommerce, ionic, ionic framework, magento, mobile, opencart, phonegap, prestashop, product catalog, woocommerce, wordpress. Premium CodeCanyon FashionShop Android App 20901192 WordPress Themes, Website Templates, Mobile Themes, Flash Templates & Scripts from creative professional designers. Full details of CodeCanyon FashionShop Android App 20901192 for digital design and education. CodeCanyon FashionShop Android App 20901192 desigen style information or anything related.